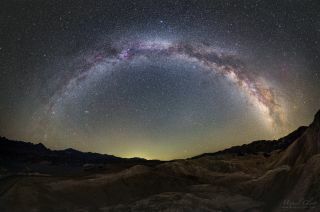 The arc of the Milky Way lights up the sky over Zabriskie Point in California's Death Valley National Park in a panoramic photograph captured by veteran astrophotographer Miguel Claro. Miguel Claro is a Lisbon, Portugal-based professional photographer, author and science communicator who creates spectacular images of the night sky. As a European Southern Observatory photo ambassador, a member of The World At Night and the official astrophotographer of the Dark Sky Alqueva Reserve, he specializes in astronomical "skyscapes" that connect Earth and the night sky. Join him here as he takes us through his photograph "Milky Way from Zabriskie Point in Death Valley." The shimmering arc of the Milky Way stretches high in the sky in this view of Zabriskie Point in California's Death Valley National Park. In the top center of this panoramic shot is the bright blue star Vega, which shines with an apparent magnitude of 0.0 and serves as the midpoint on the stellar brightness scale. Vega is part of the Lyra constellation and is one of three stars that form a star pattern, or asterism, known as the Summer Triangle. The other two stars in the asterism are Deneb (in the constellation Cygnus) and Altair (in the constellation Aquila). The bright, elliptical and diffuse dot at the left side of the photo is the Andromeda galaxy. In the opposite direction, near the right edge of the picture, is the orange-red supergiant star Antares, located in the constellation Scorpius. Antares is setting below the hot horizon of Death Valley's landscape. On the night that this shot was captured, in August, the air temperature near midnight was 106 degrees Fahrenheit (41 degrees Celsius). In the center right, and below the arc, is a faint white light known as gegenschein, or "counterglow." This is a faint brightening in the region of the sky opposite the sun. Like the zodiacal light, a faint glow created by sunlight scattering on particles in the atmosphere, the gegenschein is caused by sunlight scattering off of interplanetary dust. To see more of Claro's amazing astrophotography, visit his website: miguelclaro.com. Follow us @Spacedotcom, Facebook and Google+. Original article on Space.com.